Antique metal toy trunks can be used and displayed in many different ways in your home. Metal toy trunks were very popular in the early decades of the 1900s to hold doll clothes. Many dolls came with their own trunks full of clothing. The designs depended on the doll, the manufacturer and the era. For example, a doll from the Victorian period might come with her own steamer trunk full of gowns while a fashion doll from the early sixties might have come with a plaid trunk. Another type of metal trunks were the Army trunks that came with the GI Joe action figures in the sixties. These trunks were olive green and were exact replicas of the real foot lockers. Joe's uniforms as well as accessories all fit in the trunks. They are now a favorite of collectors everywhere and in good condition command premium prices. These trunks as well as the larger ones are rarely found in pristine condition. Since they were playthings, held playthings, and were used daily, in most cases they will normally show signs of heavy wear. This should be expected. There are some things you will want to check for and make sure of before you purchase any antique metal toy trunks. Of course this is difficult if you are buying from an online source. In that case it is very important that you ask questions and make sure that you understand the seller's guarantees (make sure they are written) and return policies. If you find a trunk in a local antique shop there are a few things you will want to check for. Make sure the hinges are present and original. Since hinges get so much use they often break and are replaced. If the hinges are not original to the piece the value is going to be much lower than if they were authentic. 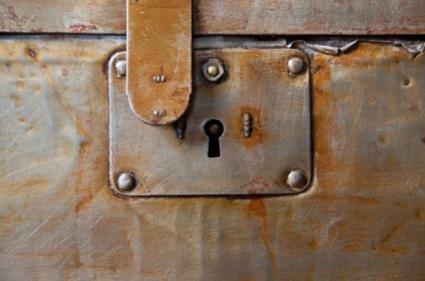 Hinges may also have rusted and it does not hurt to gently clean the rust off. Some metal trunks have leather bands or straps. These may be peeling or cracked. You can often bring them back to better condition by using a saddle cleaner or dressing. Once you have them clean use the dressing every month or so to keep them moisturized, soft, and supple. Clasps, like hinges get a lot of wear. Preferably they will be present and original to the trunk. If they are rusted you can polish them gently. If something is broken or missing but you just love the trunk you can find replacement parts one of two ways. If you are very patient you may be able to pick up authentic antique parts on eBay or other venue that specializes in vintage hardware. You can also find replacement hardware at specialty shops like Van Dykes. You will want to try to match the original hardware as closely as possible. You will need to check regularly so that you don't miss an opportunity to get one. Local antique stores may have them on occasion. It is a good idea to get to know a few antique dealers and let them know what you are looking for. That way they can be looking for a trunk when they go to auctions. While an antique trunk may be difficult to find eventually your patience will be rewarded. When you see what you are looking for be prepared to buy it. Thinking about it may mean you lose out totally.